I have heard it said (by people opposed to killing and eating kangaroos) that Australians are the only people who eat their country’s coat of arms. 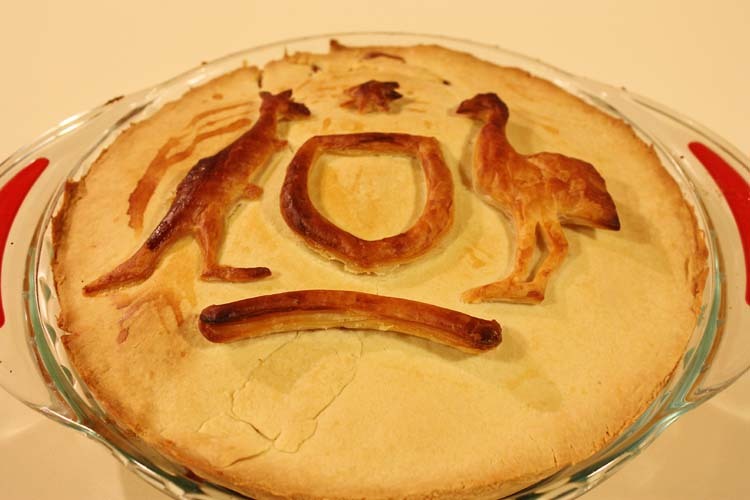 So when I bought emu meat, which is rarely available, what better way to eat it than in a pie with kangaroo. 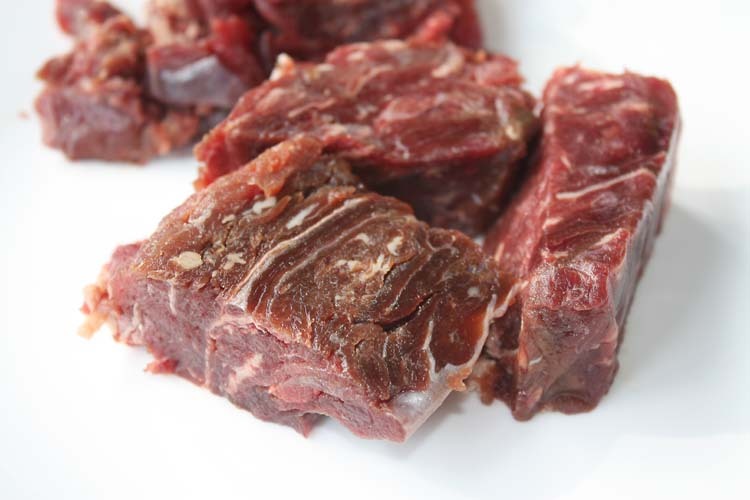 Kangaroo meat (I used mince) is 98% fat free, high in protein and very rich in flavour. Emu meat is also claimed to be 97% fat free and high in protein. So the pie should at least be healthy! The emu meat came diced and frozen. I browned the kangaroo mince, an onion and the emu meat in olive oil in a pan. At this stage the emu meat broke up into smaller pieces, not much bigger than the mince. I then put it all in a slow cooker with water, and cooked it for 3 hours on high, at which stage it was all beautifully tender and tasty. Then it was time to make pastry (my first time). I decided on shortcrust pastry which I prefer to flaky pastry. My pastry recipe was 3 cups flour, salt to taste, 200g butter, 2 egg yolks and 75ml water. After mixing the flour with salt and butter and working until there were no lumps of butter, I added the egg yolks and water to make a dough that wasn’t sticky. I rolled out the base and blind baked it. Then it was time to thicken the emu/roo mix with a little gravox and cornflour and put it into the base and then roll out more pastry for the top. A little decoration in flaky pastry courtesy of my son was added , and into the oven for about 30 minutes to cook and brown the top. It looked almost too good to cut and eat! Served with a dollop of Outback Spirit Kakadu Plum Sweet Chilli Sauce, this was possibly the nicest, tastiest pie I have ever eaten. The pastry was delicious and the filling had so much flavour, a real meat lovers pie. I’m not sure how much of the flavour was from emu, I think the strong kangaroo meat overpowered the emu. When I tried a little bit of emu before combining the meats, I thought it was quite mild and maybe even had a slight fishy flavour. I’ll just have to try it again on its own. And I will certainly make kangaroo pie again. 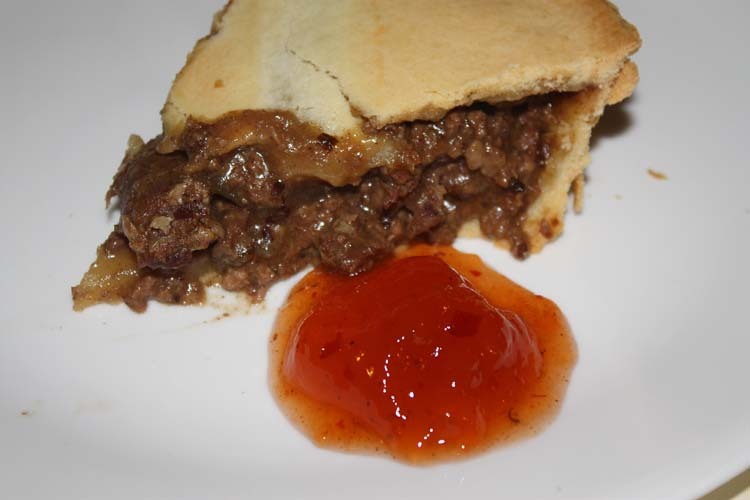 This entry was posted in Meat dishes, Meat pies and tagged bush tucker, cooking, food, meat, meat pie, pie, wild foods. Bookmark the permalink.